The International Space Station, as seen from the departing space shuttle Atlantis on May 23, 2010. 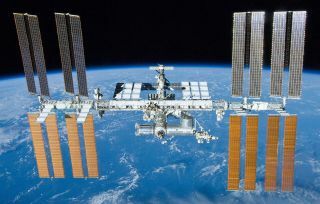 The International Space Station (ISS) completed its 100,000th orbit of Earth early Monday morning (May 16), NASA officials said. "This is a significant milestone and is a tribute to this international partnership, made up of the European Space Agency, of Russia, Canada, Japan and the United States," NASA astronaut Jeff Williams said in a video tribute recorded aboard the orbiting lab. The first component of the ISS was launched on Nov. 20, 1998. Ever since then, the orbiting lab has been zooming around Earth at 17,500 mph (28,164 km/h), completing one lap every 90 minutes or so at an altitude of about 240 miles (386 kilometers). During its 100,000 orbits, the ISS has traveled more than 2.64 billion miles (4.25 billion km) — the rough equivalent of 10 roundtrip Mars missions, and nearly the distance to Neptune, NASA officials said. Nobody lived aboard the ISS during its initial assembly stages. But the $100 billion orbiting complex, which contains about as much living space as a five-bedroom house, has been permanently occupied by rotating astronaut crews since November 2000. Space station expeditions typically consist of six crewmembers, each of whom lives aboard the outpost for five to six months at a time. A total of 222 people have visited the space station over the past 15.5 years (including a handful of space tourists who paid their own way). NASA officials said. NASA and its partner agencies view the ISS as a key steppingstone to more distant destinations such as Mars. More than 1,900 experiments have been performed aboard the orbiting lab to date, many of them designed to help researchers and mission planners better understand how humanity can push farther out into the solar system. The ISS is scheduled to keep flying through 2024, though NASA and its international partners are considering extending the orbiting outpost's lifetime through 2028. When the time comes, the ISS will be intentionally de-orbited over a stretch of empty ocean, and most of the structure's components will burn up in Earth's atmosphere.